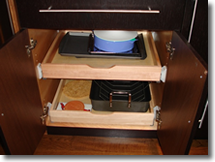 Rollout Shelves provides convenient access in base cabinets and pantries. 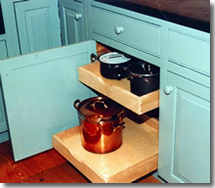 Organize kitchen through Rollout Shelving To provide proper storage within the given space is today’s demand. 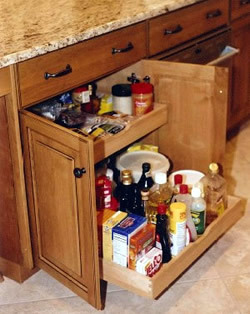 Kitchen specially requires proper storage for keeping grocery or other pantry items. Therefore, kitchen cabinets have reached to the next level and more specifically designed according to the convenience of people. The visibility and easy access to contents of the kitchen items has made us to create rollout shelving. They rollout very smoothly even when fully loaded. You can easily search even the minor items without any hassle. The cabinets are very easy to clean and manage. We mainly install two shelves per cabinet. However, it can be customized in different sizes and shelves.